The Institute of Chartered Financial Analysts of India (ICFAI) administers IBSAT Business Studies Aptitude Test every year for admission into its MBA/PGPM/PhD programme at IBS Bengaluru, IBS Ahmadabad, IBS Gurgaon, IBS Hyderabad, IBS Dehradun, IBS Jaipur, IBS Mumbai, IBS Kolkata and IBS Pune campuses and PhD program (full-time/part-time) at IBS Hyderabad campus. The selection process result of IBSAT 2018 has been announced. Candidates interested in the above-notified courses could apply online, by either buying their information bulletin from the official website or they can purchase the same from any of the near IBS marketing branches. The test is Online Computer Based spread over two days, distinctively. Willing candidates can apply for IBSAT from the link given on our page. Latest: IBSAT 2018 Selection Process Result for PGPM is now Available. Click here to check the same. IBSAT is administered by ICFAI. It is held yearly for entrance into its MBA programme as offered over its spread campus pan India. It also offers admission into part time or full time Ph.D programmes. The online availability of IBSAT information bulletin has started from July 01, 2018 and filling of form only through online mode will follow thereafter. Below we have mentioned a complete table of date particulars relating to IBSAT 2018, as released officially. The applicants who wished to apply for IBSAT 2018 or were not selected in the first attempt are given a golden opportunity. The candidates who had not registered for the first attempt will have to do a fresh registration. However, already registered candidates can login and apply for this golden opportunity. Candidates need to fill an online application form for the regular selection process from March 30 to 31, 2019. The result of selected candidates will be displayed as per the schedule. Candidates are requested to check the eligibility criteria and fill the online application form. Important dates for PGPM MBA admission is provided below. For more information, check details here. The Institute of Chartered Financial Analysts of India (ICFAI) has released the mock test for IBSAT 2018 on the official website. By practicing mock test candidates will get a clear idea of which topics you have to mastered and also focus on weak areas. The direct link to take the mock test is also provided below for the sake of candidates. 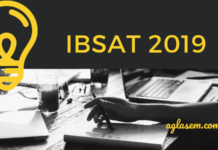 Mock Test: Click here to try IBSAT 2018 Mock Test. Candidates willing to pursue a career in terms of higher studies in MBA/PGPM/PhD programmes as offered by ICFAI-IBS must know that in order to apply for IBSAT 2018 they should be acquainted with the eligibility criteria as mentioned by the governing body for the said programmes. They must check if they meet the requisites of the provided eligibility criteria so as to have a much reformed chosen career from one of India’s most prestigious institution. The eligibility criteria for different programmes as provided by IBS varies and below we have mentioned the basic eligibility criterion for the programmes offered through IBSAT 2018. The medium of institution of applying candidates must be English. Candidates should have completed a minimum of 15 years of education in the format- 10+2+3 or 10+2+4. The minimum graduation marks (from any discipline) should be 50%. Applicants in the final year of their graduation can also apply, provided they complete their bachelors before May 31, 2019 and provide complete supporting documents for the same. Else, admission will remain provisional. The last date for submission of the same will be November 01, 2019. For candidates not meeting the first point, they will have to submit their TOEFL/NELT/IELTS score by May 31, 2019. The medium of institution of applying candidates should be English. Candidates can either have done postgraduation (full-time) in Commerce, Psychology, Economics, Sociology, Public Administration, Statistics, Mathematics, or in an allied discipline from UGC recognized university or board in India. The minimum aggregate marks should be 55%. Candidates can also have a professional qualification like CFA/CWA/CA/CS with 55% aggregate marks. Important Note– For candidates seeking admission in PhD Management programme and have an educational background in Commerce, Psychology, Economics, Sociology, Public Administration, Statistics, Mathematics, or in an allied discipline ; they are to note that if given admission, they will have to undertake the 1st year MBA courses as a prerequisite to the PhD programme. Candidates must have completed a minimum of 17 years of education. Candidates who have completed their graduation/post-graduation either from distance mod, or through part-time/one-time sitting mode will not be eligible to apply for the same. The medium of Language of candidate’s institution/university/college should be English and if not, they will have to submit their TOEFL/NELT/IELTS score by May 31, 2019. Willing candidates must take a note that in order to appear for IBSAT 2018, they should meet the eligibility criteria. Once cross-checked, applicants must know that the IBSAT Bulletin 2018 is out for sale both online and offline and candidates can thereby apply for the same. Candidates must also carefully understand that IBSAT 2018 application form is to be filled online only. The availability of Application for IBSAT 2018 has started from July 01, 2018. 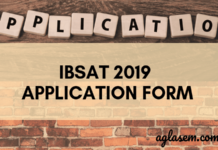 Filling in the IBSAT 2018 application form is divided into two distinctive process. Firstly, the candidate will have to buy the information bulletin as made available on the official website or from any near IBS marketing branch or through the link given on our page. Once willing candidates have purchased the bulletin at a quoted price of Rs 1800/-, they are to login and fill in the required details. Candidates can attain the IBSAT 2018 Bulletin from any of their nearest IBS Marketing Branches. In order to know the nearest IBS Marketing Branches, candidates can visit the official website as mentioned on our page down-below and click on ” IBS Marketing Branches near you”. After visiting any said IBS Marketing Branch, they can buy the information Bulletin for Rs 1800/- in cash. This IBSAT 2018 bulletin will carry the login details from where candidates will have to fill IBSAT 2018 application form through online mode. Once candidates have attained their IBSAT 2018 bulletin, they will be provided with an Application Number (as to be mentioned on at the top of the voucher) and Voucher No. ( found under the scratch area of the voucher). The application number is to be used as login id and Voucher No. as password. Once the candidate has added all the details on the official website, they will be directed to change their password. Open the official website as given below on our page. Provide your personal email id and within a week of registering online, candidates will get their IBSAT 2018 bulletin containing respective application number and password. Candidates who chose the online method of attaining IBSAT 2018 bulletin, they will have to go to the official website and mention their “application number” as their login id and provide password, which must have been given to them in their mail post their online registration.Once successfully registered, candidates can proceed further to the IBSAT 2018 Application Form filling. Herein, candidates must make sure that they provide all correct details with extreme care. Their previous qualifying marks should be accurately mentioned. They are also required to upload a recent color photograph of full face till the shoulders in jpeg or gif format. The size of the photograph must not exceed 25KB. They should also keep all the supporting documents, if the need be, ready. Any candidate willing to attain the IBSAT Bulletin, either offline or online, will have to make a payment of Rs 1800/-. If the candidate buys the Bulletin offline, she/he can make the payment in cash form. If the bulletin is bought online from the official website, the mode of payment can either be- Debit/Credit Card/Net Banking. Admit card per candidate wise will be released post the closing date of application form for the same. As announced officially, admit card is to be made available on the official website in a week or two before the date of exam, i.e, somewhere around December 2nd week, 2018. 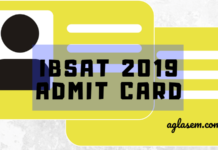 Admit card for IBSAT 2018 is to be made available online only. In order to download admit card, a candidate will have to visit IBSAT 2018 official link and enter their login credentials as processed during the time of application form filling. Admit Card is necessary to be carried by the candidates on the day of exam. Candidates must download their admit card and get a clear printout of it. Originally downloaded and printed admit card will be considered valid only on the day of examination. IBSAT 2018 will be an online aptitude test conducted by The ICFAI for students seeking admission to the MBA/PhD programs of IBS Hyderabad and other branches. IBSAT 2018 is to be held on December 22-23, 2018. The test will be of 120 minutes, i.e. of two hours and aim to check the candidate’s quantitative techniques, data interpretation, data adequacy, vocabulary, analytical reasoning and reading comprehension. IBSAT 2018 will consist of multiple choice questions. Post the exam being conducted via Online Computer Based Test, selection of candidates in their chosen programme will be based on past academic record and their performance in Group Discussion and Personal Interview. IBSAT 2018 result is released on the official website as the examination for the same has been conducted. Candidates have to visit the official website for IBSAT 2018 and under the section “Latest updates”, then they have to click the news concerning IBSAT 2018 results. Post clicking this drop down button, they have to provide their login credentials so as to check their respective result. Once result for IBSAT 2018 has been announced, qualifying candidates will further be intimated regarding selection briefing on the official website online. The selection process will involve Group Discussions and Personal Interview. Finally, post all the legs of the examination procedure will a qualifying candidate be selected for his/her chosen programme. The fee structure for different programmes at different IBS branches varies. Candidates can go through the given fee structure for a brief understanding of the same.